Years before I trained to become a Montessori directress (teacher) and early childhood educator, I found the laughter of children playing to be charming and infectious. It never occurred to me that I should feel irritated by the noise level. At the far left of the photo below you can see a tan coloured low rise apartment building – pension as they are called in Japan. When I was a teenager living in Tokyo and attending an international school, we lived in a house right next to this junior elementary school. (Years later it was ripped down, along with the landlord’s house next door, and replaced by the low rise.) 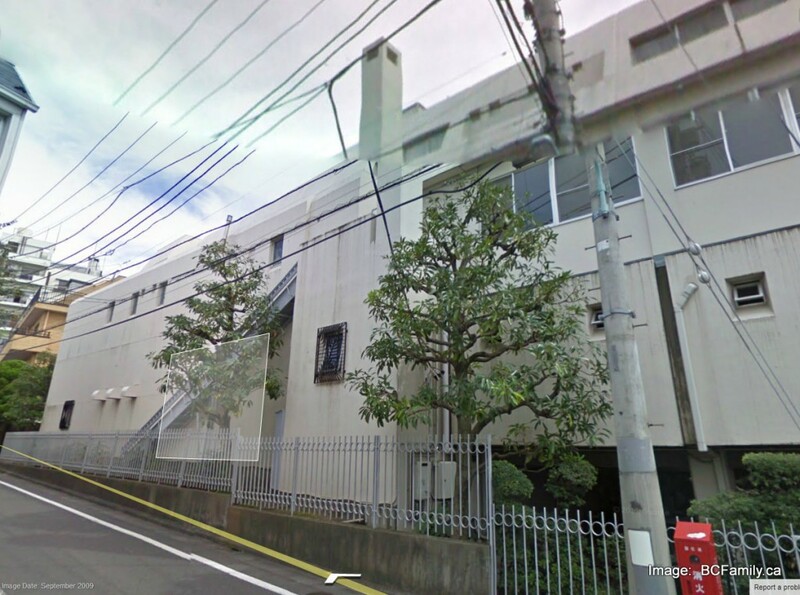 The school is located in the heart of Tokyo. Both of these homes were flush against the school and dwarfed by the building. It was unavoidable that we could hear the laughter of children as they played in the rooftop playground at lunch and break time. My parents didn’t complain about the noise and I do not recall any stories about children and their noise level at the time or a few years later when I returned to Japan to work for an international company. Fast forward to 2013 and the situation in Tokyo and Japan is quite different. There are routine complaints levied against local children during the summer months – while they play outdoors – or schools where young children are playing. In a country where the birthrate is alarmingly low, these complaints about children in Japanese society are surprising. It is not just in Japan where we hear complaints and reservations about children in the public domain. Just recently we booked to stay in a Gulf Islands B&B. The owner of the B&B went out of her way to emphasize to my husband that her place is not child friendly. As we are looking for a B&B where the children can sleep in the same area as us, we decided to stick with this selection. We don’t feel that our almost four year old twins are furious balls of energy crashing into a room; however, even though the B&B has a great reputation, we are left feeling a bit skittish about our upcoming stay. Stories about airline passengers and their dislike of noisy children on board have been circulating for years. In 2011 Malaysia Airlines famously banned babies from 1st class on its Boeing 747-400 jets and planned to do the same on their Airbus A380 planes. In one British poll, 75% of business travelers listed children as the most annoying issue while traveling. As a member of a Canadian foreign service family, I flew on long haul flights starting as a newborn baby at age four weeks. On my first flight – which took two days – my mother traveled with my two year old brother and me. My father was already in Africa. When I was old enough to notice other children – and years later as an adult – I can say without reservation that I did not notice unruly or loud children on planes. I do, however, have many memories of unpleasant adults, grumpy behaviour and even air rage. Let’s keep this conversation about children on planes in perspective. 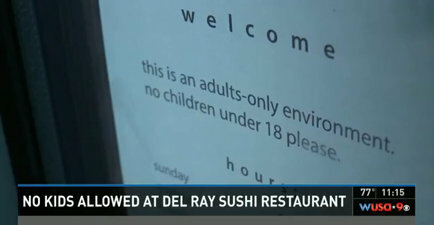 Recently a sushi bar in the Del Ray neighbourhood of Alexandria, Virginia banned anyone under 18 from dining at the restaurant. The owners want to provide a space where parents can take a break and, presumably, other customers can avoid dining with youth nearby. I had attended a lot of meals in fine dining establishments by the time I was 18th. I grew up in a different era when youth were expected to hold a conversation with other diners during dinner. Nowadays you’re more likely to encounter a youth playing a game on their iPhone during a meal. To be fair, though, not all youth are like this and most of the ones I know are just as polite and well behaved in restaurants as any adult. Since they are less likely to talk loudly, be difficult with the waiter, send food back and drink too much , I’d argue that youth make better clients. Certainly the youngest children might have a harder time in restaurants but most parents of the very young either stay at home, bring their children to family restaurants or settle into a system that works in more adult oriented restaurants. We make sure that we have our own collapsible booster seats on hand, if they are needed, and bring a selection of paperbacks and drawing boards. Our children routinely attend two hour dim sum lunches that can last as long as three hours. 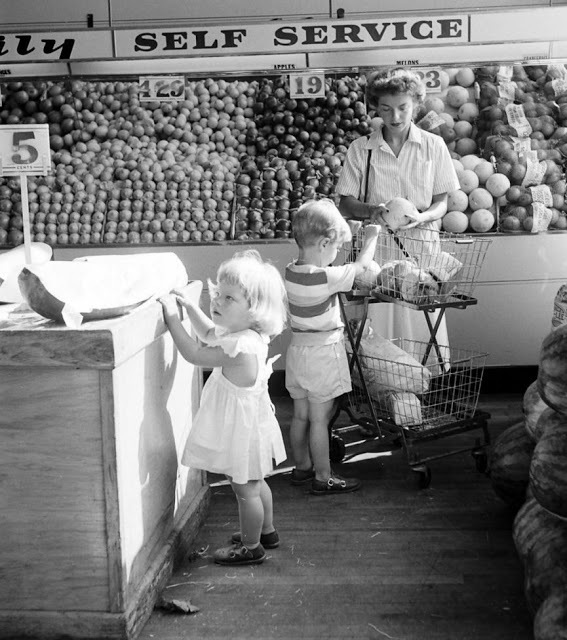 Just yesterday we went – en famille – to shop at a local grocery store. We are on a new lifestyle plan for eating and want our 3 1/2 year olds to be even more involved in the “health eating awareness” process. 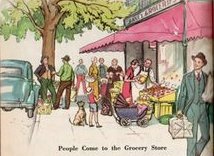 They are very keen on going to the grocery store, talking about food choices and developing and using shopping lists. When we arrived at the parking lot, one of our children had a discreet meltdown. He wanted his tears to be wiped so that others wouldn’t see that he had been crying in the car. I share this personal detail to emphasize that the reason was fairly rational – at least in the eyes of a pre-schooler. We were in the midst of pushing two shopping carts and trying to get out of the path of oncoming cars. There were tears, discussions amongst the adults and efforts to hold it all together. In the midst of all of this a 40-something year old man stopped and said “would you like my shopping cart?” “Oh yes. Thank you”, I replied, “here’s my looney.” “No keep it”, he said. “I’m a dad too. I know how it is.” He didn’t need to forgo his looney but by doing so he emphasized that he was supporting us in our attempt to get out into the public domain with our youngsters. I tried to erase her intolerant attitude and focussed on moving around the store with one of my twins. We had an enjoyable and relaxing time cruising through the store, discussing our food choices and options. By this time we had split the list with my husband and had sent him on his way. What are your thoughts about these and related topics? Are we tolerant enough of youth in public spaces or do we make allowances when we shouldn’t? How are your children faring as they rub shoulders with the older set? What kind of feedback are you hearing? Ha ha, I’ve gotten my share of dirty looks before. You’d think these other people have never had children, nieces, nephews, grandchildren…I’ve learned to shrug it off but I do feel we need to learn to be more tolerant and kind as a society. Hi, Lori, I really wonder what’s behind those looks but maybe it’s best not to think about it. Having said that, I realized after writing this piece that I had put two contrasting examples of the community of parents together – the parent who was understanding and reached out and the “tsking” parent. I encountered both within a span of 15 minutes.